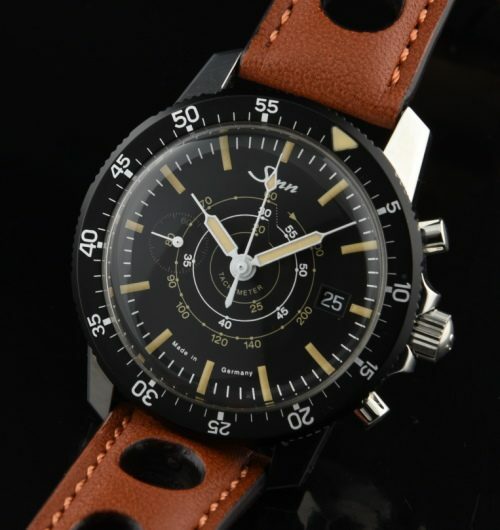 This is a Sinn Tachymetric Chronograph Manufactum Edition Pilot’s watch which was sold exclusively through the numerous stores of the German retail chain Manufactum GmbH & Co. KG. and only 100 of these watches were produced. The movement is the highly regarded Valjoux 7750 manual winding chronograph. Three out of four hands are coated with vanilla-toned Supeluminova. A luminous substance that also covers the stick-shaped hour markers, as well as the triangle on the bezel allowing for easy night time reading-just like the pilot’s would have needed in WW2. The steel case measures 41mm. across. This limited edition is sold-out everywhere. I am really prone to wanting to keep this watch as it offers a SPECTACULAR vintage look. This comes complete as new-box and papers, original band and buckle. I wore this watch about 10 times. I will truly miss it-and may regret selling.